For his father, president of Diamond Match Company and Assistant Secretary of War, see Edward R. Stettinius. 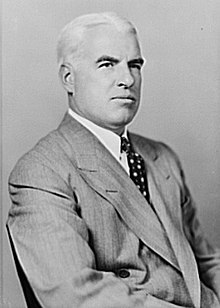 Edward Reilly Stettinius Jr. (October 22, 1900 – October 31, 1949) was an American businessman who served as United States Secretary of State under Presidents Franklin D. Roosevelt and Harry S. Truman from 1944 to 1945, and as U.S. Ambassador to the United Nations from 1945 to 1946. He was born in Chicago, Illinois on October 22, 1900, the younger of two sons and third of four children of Edward R. Stettinius and Judith Carrington. His mother was a Virginian of colonial English ancestry. His father was of German descent and was a native of St. Louis, Missouri. The younger Stettinius grew up in a mansion on the family's estate on Staten Island and graduated from the Pomfret School in 1920 after which he attended the University of Virginia until 1924. He finished very few courses and never took a degree, Instead he spent his time on charitable outreach to poor families. He became a member of the secret Seven Society. On May 15, 1926, Stettinius married Virginia Gordon Wallace, daughter of a prominent family of Richmond, Virginia. They had three children: Edward Reilly and twins Wallace and Joseph. In 1926, Stettinius began working at General Motors as a stock clerk, but his connections made for rapid advancement. He became assistant to John Lee Pratt, a friend of the family, and by 1931 he had become vice president, in charge of public and industrial relations. At General Motors, he worked to develop unemployment relief programs and came into contact with Franklin Roosevelt. In the 1930s, Stettinius's work in the private sector alternated with public service. He served on the Industrial Advisory Board of the National Recovery Administration (1933), but in 1934 he returned to the private sector when he joined U.S. Steel, the nation's largest corporation; he eventually become chairman in 1938. He then returned to public service, serving on the National Defense Advisory Commission, as chairman of the War Resources Board (1939) and administrator of the Lend-Lease Program (1941). He held the latter position until he became undersecretary of state in 1943. The poor health of Secretary of State Cordell Hull made him chair the 1944 Dumbarton Oaks Conference and, in December 1944, succeed Hull as Secretary of State. Stettinius was a member of the US delegation to the 1945 Yalta Conference. Truman thought Stettinius was too soft on communism and had yielded too much to Moscow when he was Roosevelt's advisor at Yalta. Truman had an old Senate friend in mind as a replacement, James F. Byrnes. Stettinius resigned as Secretary of State to take up the position of the first United States Ambassador to the United Nations. He chaired the United States delegation to the United Nations Conference on International Organization held in San Francisco from April 25 to June 26, 1945, which brought together delegates from 50 Allied nations to create the United Nations. Charles W. Yost, who had been Under Secretary of State Stettinius' assistant in the State Department, was named Stettinius' Executive Secretary at the United Nations Conference. Stettinius resigned in June 1946, as he became critical of what he saw as Truman's refusal to use the UN as a tool to resolve tensions with the Soviet Union. For three years after his return to private life, he served as rector of the University of Virginia. In 1947, Stettinius and friend William Tubman, the president of Liberia, helped form the Liberia Company, a partnership between the Liberian government and American financiers to provide funds for the development of the African nation. During his retirement, Stettinius lived at his Virginia estate, The Horseshoe, on the Rapidan River. He died of a coronary thrombosis on October 31, 1949, at the home of a sister in Greenwich, Connecticut, at the age of 49, and was buried in the family plot in Locust Valley Cemetery, Locust Valley, New York. Stettinius's voluminous archive of more than 1,000 boxes resides at the Albert and Shirley Small Special Collections Library at the University of Virginia. ^ Chernow, Ron (1990). The House of Morgan: An American Banking Dynasty and the Rise of Modern Finance. New York: Grove Press. pp. 188–189. ISBN 978-0-8021-3829-3. ^ Johnson, Bill (1965-02-15). "Seven Society's Secret Still Secret". Washington Post. pp. C8. ^ Herman, Arthur (2012). Freedom's Forge: How American Business Produced Victory in World War II. New York, NY: Random House. pp. 80, 87–90. ISBN 978-1-4000-6964-4. ^ Herman, Arthur (2012). Freedom's Forge: How American Business Produced Victory in World War II. New York, NY: Random House. pp. 70–1, 80, 87, 89, 125, 127, 150, 153, 155. ISBN 978-1-4000-6964-4. ^ Lafeber, Walter (1989). The American Age: United States Foreign Policy at Home and Abroad Since 1750. New York: W.W. Norton. pp. 417–418. ISBN 0-393-95611-3. ^ Michael J. Devine and Nathan Giles. "Stettinius, Edward Reilly, Jr."
Johnson, Walter. "Edward R. Stettinius, Jr.," in An Uncertain Tradition: American Secretaries of State in the Twentieth Century, ed. Norman A. Grabner (1961). Wikimedia Commons has media related to Edward Stettinius, Jr..
"The Optimist". Time. 1949-11-07. Retrieved 2008-08-14.